You’ll get a confirmation email right away! 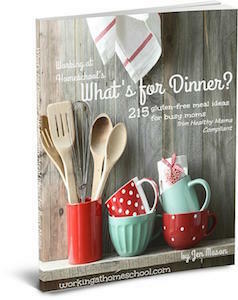 Helping busy moms to eat well, get organized, and get the most out of every day. This post may include affiliate links. Purchasing through these links might help me to buy a cup of fancy coffee (but not a fancy car) at no additional cost to you, so thanks! because we’ve started some new family traditions that we are really enjoying (that sounds better, doesn’t it?). This year, since I have total menu control (read: no one else to help me with the cooking), we are having a Trim Healthy Mama Thanksgiving. A good one. I am making an amazing turkey recipe that I’ve made before, delicious sides, and thirty-five desserts (not really, it just feels that way). This is an “S” or low-carb meal, but be aware that there ARE small amounts of carbs, which can stack up. If you eat TONS of this food, you may end up in S Helper territory – which is totally fine, and still a part of the Trim Healthy Mama lifestyle. If, however, you decide to go off-plan, you can always use my Cheat Recovery Meal Plan to get back on track on Friday! 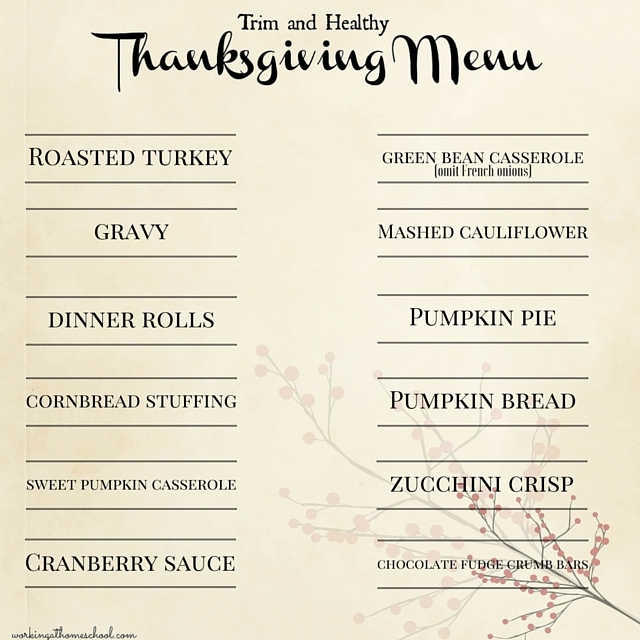 Here is my Thanksgiving Menu with a free printable shopping list. This is what the menu looks like, but to get the clickable links and see the recipes you’ll need to download the PDF with the blue “Download” button at the bottom of this post. That’s where you’ll get the printable version. **Note – the turkey recipe linked calls for brown sugar, and I substitute Just Like Brown Sugar, or just omit it entirely. It’s tasted great to me both ways BUT I know that as the centerpiece of the meal you want to be extra careful and may not be comfortable with substitutions. You can always substitute a family favorite turkey recipe or any other turkey recipe that doesn’t call for sugar. 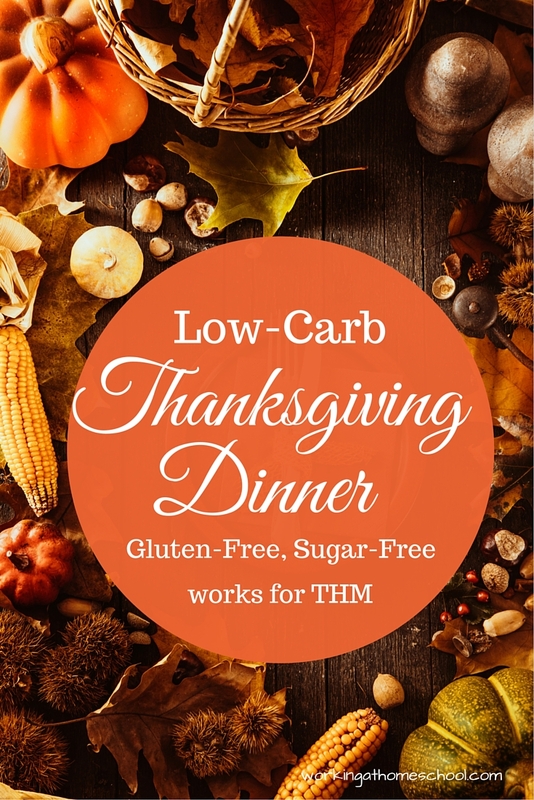 If you need low-carb sweeteners or baking blend, you can get those at the Trim Healthy Mama online store. The shopping list is a little different from my normal monthly shopping lists – I listed the ingredients by meal instead of ingredient type/aisle because I know some people have family favorite recipes they will want to substitute for the recipes listed here. I hope that makes it easier for you. Happy Thanksgiving! Hi! I’m so glad you’re here! I’m a working-at-home homeschooling mom of 5. I write about my experiences homeschooling and share lots of tips about organization and the Trim Healthy Mama way of eating. I personally answer every comment and email, so please feel free to contact me. I’d love to hear from you! I downloaded the pages as instructed but can’t find the actual recipes. Am I missing something? Hi Kelly! The PDF is clickable, so all of the recipes are linked into the menu. If you click on the recipe name or item on the menu, it will take you to the recipe. So by signing up, will email clever each months new plans and grocery lists in our email? Also, are all your recipes kosher? Hi Sarah! Yes, you get each month’s menu when you sign up. I try not to email everyone too much because I hate getting tons of email from bloggers. I downloaded the menu and all the recipes are there but where is the shopping list? The shopping lists are on pages 3 & 4 of the menu. 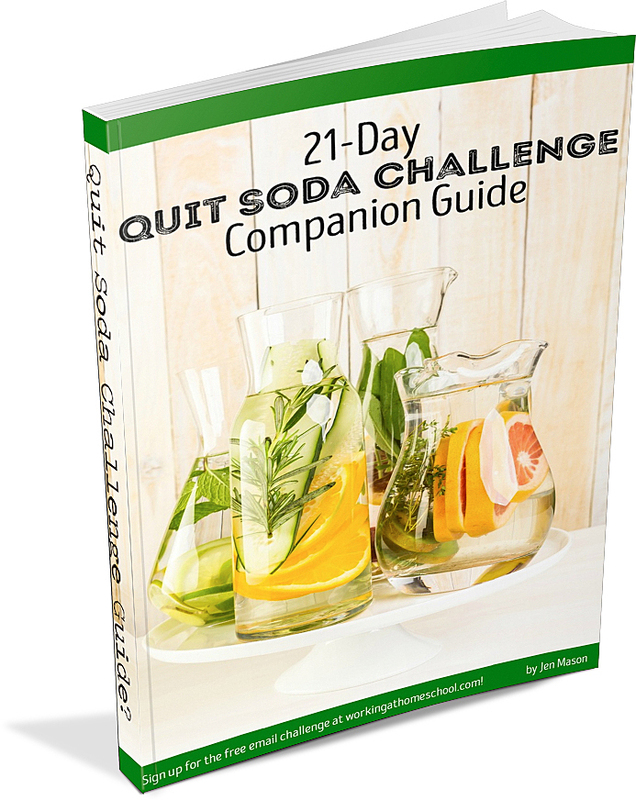 Check out my new self-paced guide to quitting soda for good! For the cost of just a few of the sodas you’ve decided to give up, you can take the 21-Day Quit Soda Challenge to the next level and get serious about quitting for good. Workingathomeschool.comis a participant in the Amazon Services LLC Associates Program, an affiliate advertising program designed to provide a means for sites to earn advertising fees by advertising and linking to amazon.com. Next Post Are You Stressed or in Distress?